Deep vistas. Narrow minds. That’s the visual and thematic takeaway from The Tin Star (1957), one of director Anthony Mann’s finest achievements. Bounty Hunter Morg Hickman (Henry Fonda) rides into town with a dead outlaw slung over his horse’s back. From the very first dolly move, as the camera swings around to capture his horse’s slow saunter, to its tethering and Fonda’s entering the sheriff’s office, there is a dimension and air between the characters, the set pieces and the lens that gives an almost 3-D effect. By the late 1950s, directors and cameramen had a solid understanding of the widescreen format. And while earlier widescreen directors forcefully staged characters flatly on either side of the long stretched image, the latter day filmmakers referred back to the long axis (first displayed to great effect in silent cinema) for stronger theatrical impact. The theory of the long axis is that, much like theatrical staging, the most powerful position for any character is upstage (towards the back) and the submissive or foil characters is downstage (near the bottom). Characters in the background that stride slowly from a distance towards the lens create the greatest visual tension. The camera can also be placed over a character’s shoulder, as they look away from us, deep into the center of the frame. No one staged these suspenseful images in the late ’50s better than Mann. In the Sheriff’s office, the bright interior and big open windows give an unbelievable view all the way down the town streets on either side of the room. Cinematographer Loyal Griggs’ deep focus only helps to build on the depth and symmetry between objects. Historically, interior scenes were shot on a soundstage, with a character entering a building from an outdoor exterior. With Mann’s old west town, interior shots were actually shot inside buildings, so the connection to the town was not just implied, but real. Clint Eastwood, ever the voracious student of great filmmakers, replicated these long axis shots for Unforgiven, as the sheriff’s hired men gather in and outside his office, windows open, displaying a brightness that belies the darker forces at work inside. That’s for the film fans to savor. For the moviegoer, there is an unspoken power and heft to The Tin Star’s scenes, thanks to camera placement and staging. Fonda can’t find the Sheriff, then peering into the backroom of the jail’s , cramped, dark and tight quarters, we see a kid practicing his gun draw, dropping his revolver and fixing eyes on the lanky stranger. Shouldering his vest, the tin star that unceremoniously hangs from his chest gives us the final bit of unspoken information we need to set the story in motion. 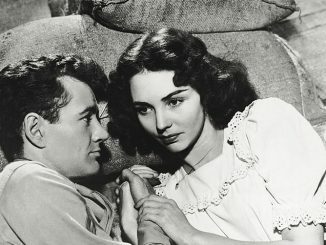 Mann’s filmography covered many genres, but he is best known for, and excelled at Noir in the ’40s and Westerns in the ’50s. He was often matched up with James Stewart, from the stellar Winchester ’73 and The Naked Spur, to The Man from Laramie as well as several other Westerns, melodramas and war movies. But this was Mann’s first and only teaming with Henry Fonda, and their blending couldn’t be more perfect. 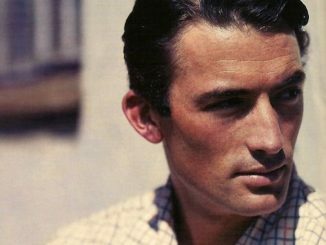 Fonda’s Hickman, at first reviled by the town for his occupation, then embraced, is almost immediately admired by Anthony Perkins’ naïve young Sheriff, Ben Owens. Hickman really just wants his bounty money and to leave, and as the wheels of payment are slow, he’s forced to wait it out while watching the Sheriff go up against badass Bart Bogardus (Neville Brand), a bully who had hoped to grab the Sheriff’s position and turn the town to corruption. With no place to stay while he waits, Hickman comes upon widowed homesteader Nona Mayfield (Betsy Palmer) who offers him a room. He immediately bonds with her son, who is half Indian. The young boy is often at the receiving end of racist Bogardus’ anger, and we start to understand the bigotry and small-minded townspeople that the young Sheriff is caught between. The Mayor and other big businessmen want him to turn a cold shoulder to Bounty Hunter Hickman, but he is the only person to offer the Sheriff advice and real world wisdom. Hickman thinks Owens is as good as dead in the no-win scenario, but he lets it slip he had once been a lawman in his day. The two strike up a father-son rapport, and against his better judgment, Hickman is drawn into the fallout from a botched stagecoach robbery and murder. Soon the town is split into three factions, the justice seekers, Bogardus’ lynch posse, and the desperate murderous brothers, holed up in their ranch. To say that The Tin Star takes its time is an understatement, but Anthony Mann’s sure-hand (second only in this genre to John Ford) guides some of the more traditional and expected story points through these tricky waters. The audience knows Fonda and Palmer will become lovers, just as they know good will win out. But as always, it’s the telling of the tale that holds our interest and Mann is one of the premier storytellers. As usual the Warner Archive Classics is paltry in extras, but the reason to rent and own this recent release is really for the film itself, its stunning images transferred with unparalleled crispness and contrast. The Tin Star is arguably the last great film by Mann, and a mandatory addition to any film lover’s library. Editor’s note: The Tin Star is available as a manufacture on demand DVD (MOD) through Warner Archive.